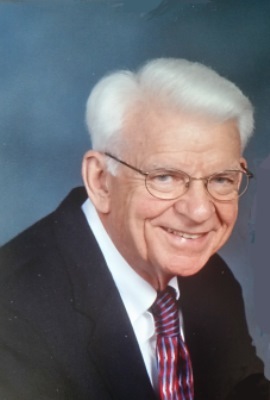 Robert Fleming, 92, of Lancaster PA, passed away on May 6, 2017 at Arbor View in the Willow Valley Communities. Born in Orange, NJ, and raised in Maplewood, NJ, he was the son of the late Homer and Alice (Waterfield) Fleming. In his early life he lettered in Track at Columbia High School in Maplewood. He also loved biking and camping with his friends and with the Boy Scouts. After high school, Bob enlisted in the Navy and served in the South Pacific during World War II as a Radioman, 2nd Class. His service in the Navy enabled him to go to Bates College on the GI Bill, class of 1949. There he met his wife, Carolyn. Bob’s career was in the field of public relations and advertising. He worked for Provident Mutual Life Insurance Company for most of his adult life. Bob read avidly, usually completing a book each week, and keeping an extensive library. He loved music and collected classical, jazz, and show music. He was especially enthusiastic about the “Big Bands.” He liked photography and set up his shots very carefully. He was a life-long New York Yankees fan. He nurtured his relationships and kept in touch with family and friends from grade school through the Navy, working life, and neighborhood life. Bob is survived by his wife, Carolyn, his son, Thomas A. Fleming (wife Joan), of Chesterfield, MI, and his daughter, Jane E. Murdock (husband Stephen), of Hopkinton, MA. His four grandchildren include Caelan Fleming, Clayton Watnoski, Stephanie Murdock, and Travis Murdock.